Chelsea Green Publishing Company, 9781603582131, 326pp. Masonry Heaters is a complete guide to designing and living with one of the oldest, and yet one of the newest, heating devices. A masonry heater's design, placement in the home, and luxurious radiant heat redefine the hearth for the modern era, turning it into a piece of the sun right inside the home. Like the feeling one gets from the sun on a spring day, the environment around a masonry heater feels fresh. The radiant heat feels better on the skin. It warms the home both gently and efficiently. In fact, the value of a masonry heater lies in its durability, quality, serviceability, dependability, and health-supporting features. And it is an investment in self-sufficiency and freedom from fossil fuels. 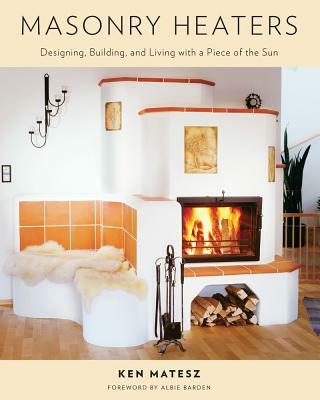 The book discusses different masonry heater designs, including variations extant in Europe, and explains the growth of their popularity in the United States beginning in the late 1970s. For the reader who may be familiar only with open fireplaces and metal woodstoves, Masonry Heaters will bring a new understanding and appreciation of massive heat storage and gentle-but-persistent radiant heat. Masonry heaters offer a unique comfort that is superior to that from convection heat from forced-air systems, and more personal than that offered by "radiant" floors. As Matesz demonstrates, the heat from the sun or from a masonry heater is genuine heat instead of just insulation against the loss of heat.